Tri-level Townhome (Sleeps 10), 4 Bedrooms + Den, 3.5 Baths. 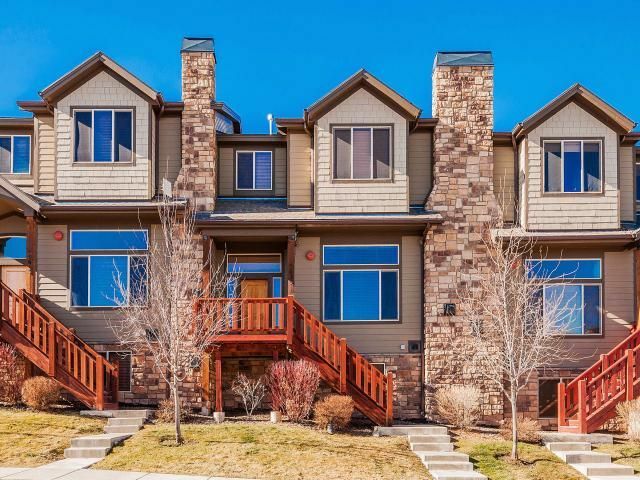 This beautifully equipped luxury four bedroom Park City townhome is a perfect base for your group of up to 10 guests. It is conveniently located in Bear Hollow Village with views to the Utah Olympic Park and open space and easy access to area ski resorts, golf, mountain biking, shopping, entertainment and dining. The town home features a gourmet kitchen with stainless steel appliances and granite counter tops. The dinning area provides seating for 6 with additional seating for 2 at the kitchen bar. Dishes, flatware, glassware, and all cooking utensils are provided including a coffee maker, microwave, toaster and dishwasher for your convenience. The master bedroom on the upper level has a king size bed, walk out deck, TV and private bath with twin sinks, and separate bath jet tub. The second bedroom has a queen size bed with TV and is located on the upper level. The fourth bedroom has bunk beds. The family room/den has a large flat screen TV, full bathroom and leather sofa sleeper. A large private spa is located on the covered rear deck. Perfect for relaxing after a great day out. All linens, towels, washer and dryer are provided. Technology equipped with flat screen TVs, DirectTV, high speed internet and a PlayStation 3. This 2200 sq. ft. townhome has a 2 car garage with additional driveway parking. Park City also operates a free bus service for access to all resorts and Main St. and within walking distance to the bus stop. Park City Canyons Village (two miles), Park City Base Area (five miles) and Deer Valley (Seven miles). It is also perfectly situated for access to other Salt Lake area resorts such as Snowbird, Alta, Brighton, Solitude, Snowbasin and Sundance. We live in beautiful Park City. Unique 3 level design located minutes from The Canyons, Park City and Deer Valley resorts,the new Park City Tech center and Redstone shopping center. 30 minutes to SLC. Private with views to open space and the Utah Olympic Park. Conveniently close to everything. (4) Living room, Master bedroom, 2nd bedroom and Family/Den. Clubhouse with Pool, Jacuzzi and fitness room. Our family had a great time in Park City and throughly enjoyed this townhome. The home was well cared for and the king, queen and full beds were comfortable. The kitchen had ample kitchen supplies and plenty of seating. Great location in the neighborhood, very quiet at night and the home overlooks open fields and the Olympic Park off in the distance. This is a great home for a ski gateway or a summer trip. Well appointed home close to shopping and restaurants. Only a short drive to the ski resorts. Awesome location for us! Great condo - clean, with all new appliances. Enjoyed having the grill on the porch for meals. We will do it again next year!! Thank you for letting us late check out 1:00pm from all five of us !! Very Clean! Had a great stay! Spacious, clean, well appointed. Delivered as advertised. Well constructed and maintained property. Great location for access to multiple ski resorts.